Natural Grocers by Vitamin Cottage announced its 2016 results (FYE 9.30.16) in November with sales up almost 13% to $705.5 million. The company opened a record 23 new stores in FY16 and closed its year with 126 total locations (since bumped to 127 by a new store opening), a 22% increase. Same-store sales for the year were up a more modest 1.4% (and a meager 0.3% in the fourth quarter), signs that new-store openings may be syphoning sales from existing locations. 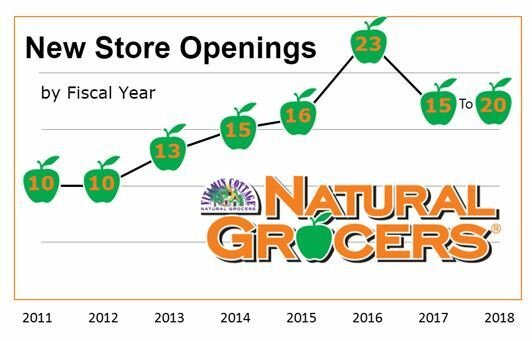 Natural Grocers will continue its expansion efforts, though the company recently scaled back estimates to 15 to 20 store openings for each of the next two years. CSG wouldn’t be surprised to see that number pulled back even further after the first-quarter or second-quarter earnings release. 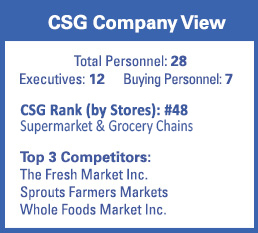 Source: Chain Store Guide’s Database of Supermarket, Grocery & Convenience Store Chains. * CSG projections based on proprietary analysis and company statements. Actual figures are subject to change. This data is not intended for investment decisions.